We first meet Tiffany Case in her underwear, which is obviously how men would like to meet most women when they first meet. ...Ms Case is playing up a classic show of misdirection. Her cunning plan is to get Bond’s glass and run it through her handy dressing table portable fingerprint machine. Every girl probably has one. You have to get up earlier than that (if she had, she may have been dressed), to catch our super spy out though, because Q branch had equipped the Commander with fake fingerprints. A-ha. 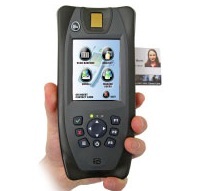 Bayometirc Inc. are one of the companies that manufacture mobile finger print scanners, as seen on the right. However, the device used in the movie was particularly ahead of its time, as recently as May 2012 it was announced that London's Metropolitan Police were scheduled to provide 350 officers with similar portable devices. "Evidence has shown that a full identification arrest can tie-up both the subject and the police officer for several hours," said the Metropolitan Police Service's assistant commissioner Mark Rowley. The devices were provided by biometric data specialists 3M Cogent.